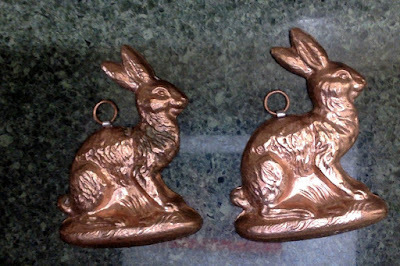 I use these copper bunny molds as decoration in spring, but they also double as candy molds. I've had them for about 15 years, and gotten a lot of mileage out of them. 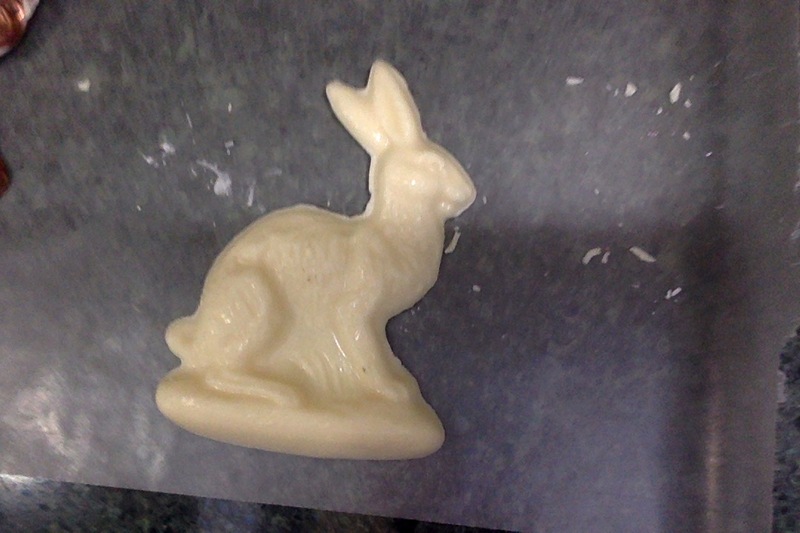 I prefer making white chocolate bunnies over milk or dark chocolate ones, as the white chocolate doesn't show "bloom" (that whitish coating that sometimes develops on homemade chocolates). It can happen on commercial chocolate, too, but is more likely to happen when DIY without sophisticated equipment. Okay, so mildly entertaining for you, right? But without cute bunny molds you're out of luck, right, for making molded chocolate. Here is another way that I have made chocolate bunnies, using an unbroken Hershey chocolate bar and a mini bunny cookie cutter. 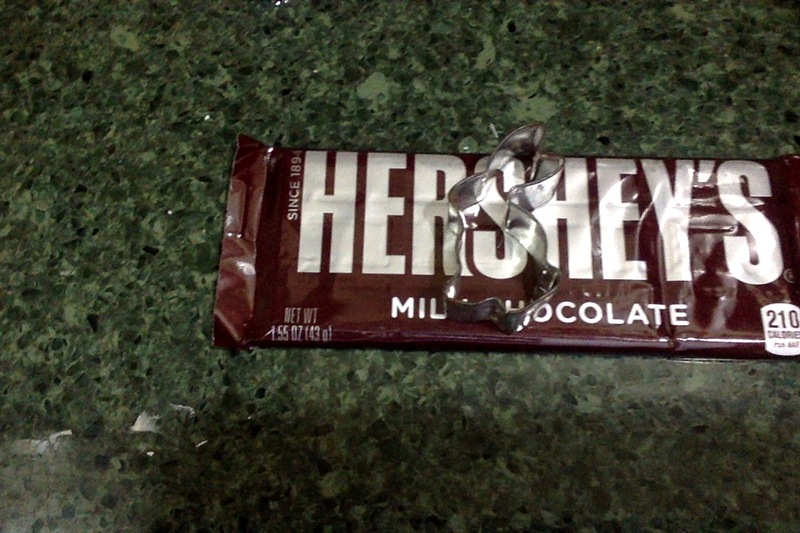 Unwrap the chocolate bar and place it, printed side down (smooth side up) on a sheet of waxed paper. 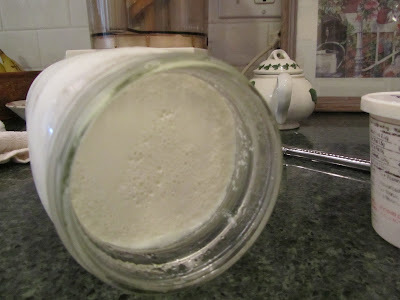 Soften the bar, very, very slightly (but not melted) in the microwave, about 10 seconds. The chocolate should be "cut-able" with a firm downward push on the cutter. Work quickly to cut out as many shapes as you can. 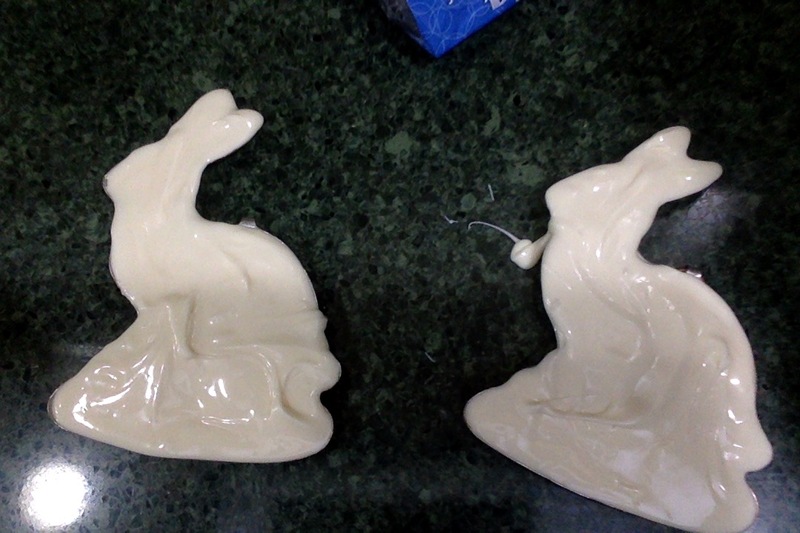 I have had to re-soften the chocolate in the microwave for about 5 seconds, part way through making small rabbits. As you make the bunnies, push them out of the cutter onto a sheet of waxed paper, then allow to harden. 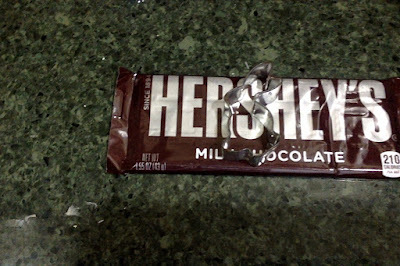 If you turn the bunnies upside down, you'll see part of the Hershey name and the markings for squares. My kids never minded that. 1 regular bar yielded 5 mini bunnies for me. 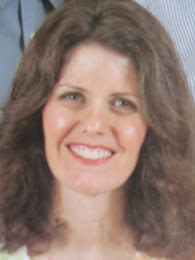 Alternatively, you can melt some dipping chocolate and spread onto a sheet of waxed paper, allow to firm up, then cut with a cutter, in lieu of using a Hershey bar. Anyway, when my son was small, and I didn't want to buy large bags of chocolate just so I could put a few pieces into his Easter basket, these homemade miniature, Hershey bar chocolate bunnies were a pretty good deal. 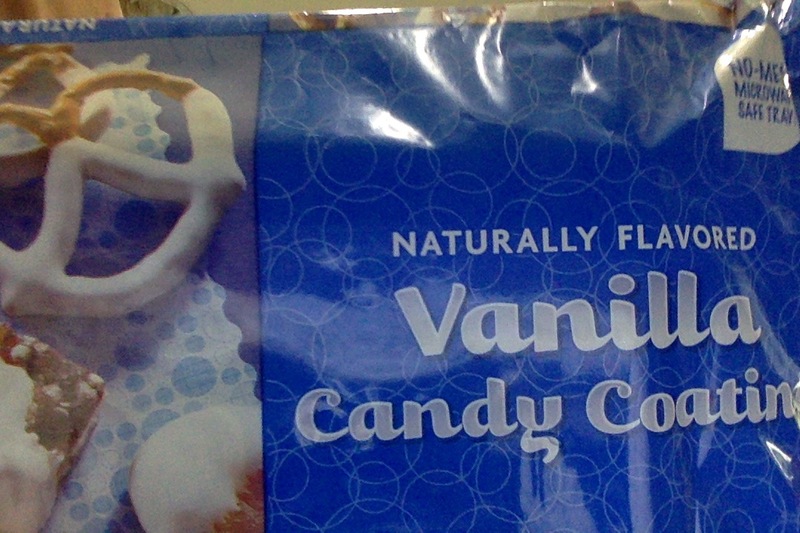 At that time, I could buy a chocolate bar for about 39 to 49 cents on sale. I would use the same cookie cutter to make him a baggie full of bunny graham crackers. 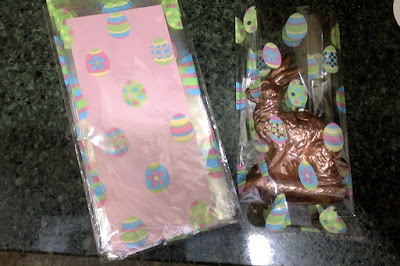 For the white bunnies, I rummaged through my stash of Easter-related bags and papers and found these cute cellophane bags. As you can see from a mold placed into one of the bags, they are just the right size. Back to the white bunnies that I made -- after chilling in the fridge for about 30 minutes I find they pop out of the molds best if I then put them in the freezer for 10 minutes. 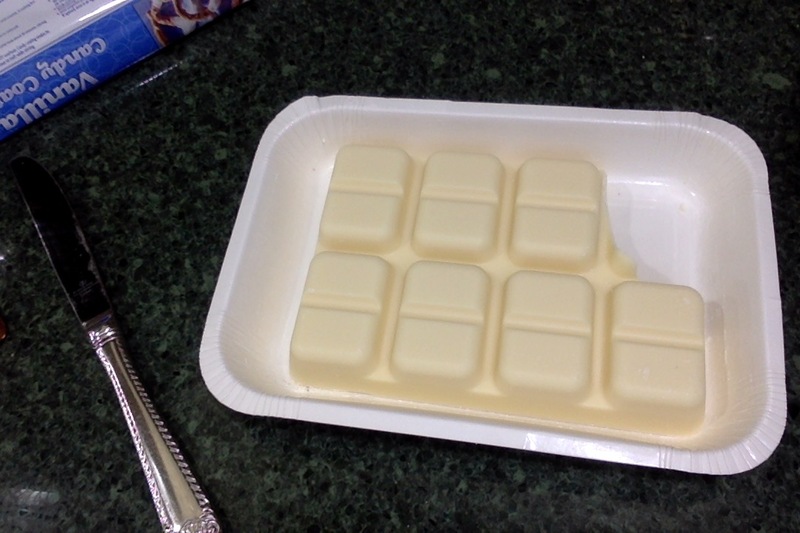 Freezing helps the chocolate pull away from the sides. If one breaks, it's usually because I forced it out of the mold or didn't allow it to freeze long enough. With a metal mold, hardened chocolate should fall out of the mold when it is tapped on the backside. With a broken bunny, I simply remelt the pieces and try again for that one. 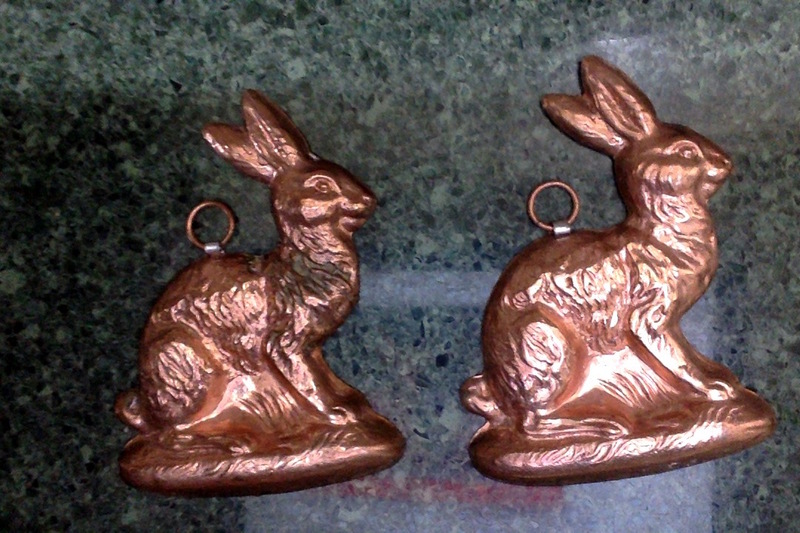 Forgot to mention, these were 3 ounce bunnies. Since I already had the molds, each one cost me 35 cents to make, plus the cost of the plastic bag (got these at Dollar Tree a couple of years ago -- 30 bags for $1, or 3 cents per bag). Thank you, Belinda. I like the way they turn out, too. I agree with Belinda. I like the idea of using chocolate bars and a cookie cutter. Gonna have to remember that tip. I'm glad to share, live and learn. Ooh, the bunnies out of a Hershey bar are a great idea! I also like the bunny molds but am not likely to do that. Call me lazy. I agree with you about the amount of chocolate, especially for little ones--it gets overwhelming! That's a super solution to give kids the fun of the holiday without overloading them on sweets. The bunny molds would be adorable for a seasonal decorating display--so sweet. The molds are really cute on our dish display in spring, I think. Yeah, especially when we just had one child, a full bag of candy was way too much. And even though my husband and I would have happily eaten all of the leftovers, seasonal candy is an expensive dessert when your grocery budget is small. The Hershey bar cut-out bunnies worked very well for us. And then when our daughters came along, I thought they were cute, that the girls would like them, and they were small pieces to be eaten at any one time. Have a happy Easter weekend, Kris!